Evaluation of evening dresses departments at Bergdorf Goodman, Saks Fifth Avenue and Bloomingdale's in New York City. Evaluation of evening dresses departments at Bergdorf Goodman, Saks Fifth Avenue and Bloomingdale's. Bergdorf Goodman is one of the city's most expensive and exclusive store. It offers quality apparel and it is the leading women's specialty store in America. Saks Fifth Avenue is a synonym for anything fine and fashionable. It emphasis on quality in every part of the stores operation and it has earned a nationwide reputation. Bloomingdale's is a fine department store that deals with everything from underwear to house wares, children's clothing, and furniture. Bergdorf Goodman store is located in the heart of the midtown tourist and shopping center, a block away from the Trump Tower shopping center and the world famous Plaza Hotel. Store is located on entire Fifth Avenue block between 57 and 58th Street with the convenient subways N, and R to Fifth Avenue entrances. In my opinion Bergdorf Goodman's store has an excellent location. It is close to the Central Park and to all fabulous stores such as Prada, Fendi or Herni Bandel. Saks Fifth Avenue is an exclusive department store located in the heart of the New York City's Fifth Avenue shopping district. It is located on 5thAvenue between 49th and 50th Street. It is easy to get to this great location by taking E or V subways available on the 5thAvenue and 53rd Street. I think that location, which Saks Fifth Avenue has, is unique because it is next to the St. Patrick's Cathedral and across the street from Rockefeller Center, one of most visited places in New York. WriteWork contributors. "Evaluation of evening dresses departments at Bergdorf Goodman, Saks Fifth Avenue and Bloomingdale's in New York City." WriteWork.com. WriteWork.com, 03 April, 2003. Web. 25 Apr. 2019. Bergdorf Goodman store is located in the heart of the midtown tourist and shopping center, a block away from the Trump Tower shopping center and the world famous Plaza Hotel. Store is located on entire Fifth Avenue block between 57 and 58th Street with the convenient subways N, and R to Fifth Avenue entrances. In my opinion Bergdorf Goodman's store has an excellent location. It is close to the Central Park and to all fabulous stores such as Prada, Fendi or Herni Bandel. Bloomingdale's also has a fantastic location. It occupies the entire square block from 59-60th Street and from 3rd to Lexington Avenues. It is easily accessible from 59th Street by taking the subway 4,5,6, N or R. I believe the location of Bloomingdale's is very convenient since the store is located on the east side of Manhattan and is just minutes from the Queens. 10a.m. to 6:00 p.m. with the exception on Thursday till 8:00 p.m., and Sunday from 12:00 a.m. to 6:00 p.m. I think that building is very well kept and handsome bronze lanterns at its entrances gives the building look of elegance. Saks Fifth Avenue is one of New York City's finest buildings. World famous window displays surround the building with the two entrances from the 5th Avenue between 49th and 50th Street. It is open on Monday through Saturday from 10 a.m. to 7 p.m., with the exception of Thursday is open till 8 at evening. On Sunday is open from 12 a.m to 6 p.m.
Saks Fifth Avenue located on 5th Avenue and 50thStreet is a flag store. Bloomingdale's building was open in 1927. It is one of newest buildings holding the finest fashion departments. It has two entrances from Lexington Avenue and three big windows between each entrance. It is open Monday through Friday from 10 a.m. to 8:30 p.m. with the exception of Wednesday till 10 p.m. on Saturday is open from 10 a.m. and Sunday at 11 a.m till 7 p.m. Window displays of Bergdorf Goodman store are not only tasteful but also very attractive. They are clever and feature well dressed mannequins combine with fabulous ideas of introducing new designed clothing. Artistic, creative and elegant are few of many words describing the Bergdorf Goodman window displays store. I think that display on Bergdorf Goodman windows are the finest and most elegant displays I have ever seen. Attached pictures of Bergdorf Goodman window displays prove the elegance and creativity. 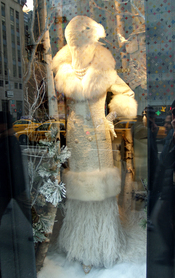 Window displays of the Saks Fifth Avenue store are a very elegant and tastefully decorated. Displays in the windows throughout the store catch customer attention and are right to the point in presenting the merchandise. Also well light up and organized. Saks Fifth Avenue window displays have always been crowd stoppers. Enclose pictures of Saks Fifth Avenue window displays are an example of elegance and creativity. Bloomingdale's window displays are very contemporary. They present different colors of the daises flower changing colors from red to blue. Window displays are very funky and interesting. Merchandise is fantastically displayed and great light up. The idea of presenting the clothing is just eye-catching. I think that Bloomingdale's displays are pure entertainment. Bergdorf Goodman store has the right mixture of theater and opulence. Its merchandise is presented in a very clean and simple way. From my observations it is well organized and cater to upscale crowd. To better help customers' with finding the merchandise, there is a written directory provided on every floor by elevator. Saks Fifth Avenues store in my opinion has a well-designed interior, which helps to find needed merchandise. Spacious environment make shopping at Saks Fifth Avenue a pleasure. Merchandise is introduced in tasty and fashionable way. The mannequins portray a sense of elegance and style. Bloomingdale's interior is lacking the elegance and sophistication that customer might come to expect from premier department store. The interior is congested and the aisles are cluttered. It is very hard to find right size merchandise. They are also unfolded and on the floor. Some departments are messy and not organized. Bergdorf Goodman offers a wide selection of fashionable and quality clothing for both women and men. Bergdorf Goodman's store is usually visited by conservative and very sophisticated clientele and also by many international customers. Bergdorf Goodman caters to professional and wealthy older ladies carrying shopping bags from St. John, Salvatore Ferragamo or Gucci. Saks Fifth Avenue has to offer rich and varied selection of fashionable clothes from conservative to casual. Women in the age of 25-40 old years mostly shop at the Saks Fifth Avenue carrying shopping bags from Gucci, Prada or Henry Bendel. Since store offers tremendous selection of merchandise from youngest to oldest I believe that it would satisfy any customer. Bloomingdale's store carry trendy to a conservative middle class clientele. It has inspired younger to buy in that store offering the best possible value for the least possible price. Mothers with children or college students are most seen shoppers at Bloomingdale's. Also middle age professional or tourist usually carrying Macys or Lord&amp; Taylor shopping bags. Bergdorf Goodman offers the complete package of ambiance, service and selection. Client services on 6th floor, shopping services on 3rdfloor or personal shopping services are just few examples of what Bergdorf Goodman has to offer. Coat check, day spa or nail service is very well known services as well. In addition, each department has its own sales representative, who is extremely professional and courteous. Unfortunately this store does not have a website or email address. Saks Fifth Avenue emphasized quality merchandise and expert service. Representative are knowledgeable and very friendly. Customer Service on 7thfloor, one-on-one Shopping Center located on 5th floor or International Ambassador desk on 1st floor is few of services that Saks Fifth Avenue offers. Also catalogs, store credit card, quarterly newsletters and exclusive promotions and giveaways are available. Bloomingdale's has lot of services to offer. International Service desk/Visitors Center located on the 1st floor features multilingual directories and shopping assistance, also size conversion charts, tourist information, ATM and a currency exchanger. On the 4th floor there is an access to Personal Shopper and fashion experts. Bloomingdale's also offers catalogs and three different ways to pay a bill: online, in store and by mail. In my opinion the service on the floor was not as professional as I expected. Looking for a specific department I had to look for representative so I could get the information and during that time nobody asked me if I need any help. Also there was no directory brochure available either. Bergdorf Goodman offers incomparable selection of fashionable merchandise. The price for evening dresses collection varies. They might be found from $950 up to$8,000. Saks Fifth Avenue provides expensive but affordable merchandise. Their prices for evening dresses were from $600 up to $ 6,000 a dress. Bloomingdale's offers evening gown in a price from $250 to $900 for a dress. Most dresses are made in Hong Kong, China or USA. In the store of Bergdorf Goodman store I have selected the evening dresses department. Those departments are located on two floors: four and six. The 4th floor is spacious and display of merchandise gives the elegant look. Well-presented mannequins represented the designed dresses of Vera Wang or Escada. Designer Vera Wang in this department had only three color dresses: red, black and sand. The price range of those dresses was from $3,000 and up and bigger sizes from 8 to 12 were available. On the 6th floor in the evening dresses department, the leading designers are: Carmen Marc Valvo, Barbara Schwarzer, David Rodriguez, Michael Akers, Jackie Rogers, Jen Valdi and Shalini. There were seven mannequins presenting dresses in the simple and clean way. On the front of the department there was two mannequins wearing sand color dresses. Displayed dresses was easy to find and each had for two dresses to buy from in the size of 8 and 10. In that department there were also three mannequins to the left wearing spring, light dresses and the wall with creative painting behind them made them look stunning. On the right hand side there was also one mannequin wearing blue dress, which had long rack of black dresses behind. On opposite side there was another well presented dress in the beautiful black color. In my opinion the buyer has taken a position in merchandising this department. The evening dresses department was very well light up and presented well. All dresses were hanging on the black plastic hangers with the Bergdorf Goodman name on them. In Saks Fifth Avenue store evening department is located on 3rd floor. This department is spacious and it has elegant style. In the middle there were five mannequins: three of them were wearing black dresses and white and gray. Evening dresses department is occupied by famous designers such as BadgleyMischka, Missoni or Yves Saint Laurent. Vera Wang's evening dresses department was located on a left hand side of the department. It is located between Zoran, Evening Salon and 5th Avenue Club. Colors of Vera Wang department were mostly red and black in 4-10 sizes. The prices of the dresses vary from $960 to $6,000. I think the buyer of this department did fantastic job. Merchandise is clear presented, well light up and greatly exposed. Bloomingdale's evening dresses department is located on 2nd floor next to Laundry, Sally Segal and Ralph Lauren. The designers of this department were Luxy, Tadashi, Vera Wang, ABS Evening by Allen Schwartz, Chetta B. Colors of those dresses were mostly black and white. Also light colors such as pink or green were available. I think this department is lack of space. Dresses are hang on rack too close to each other what created the feeling of clutter. In Bergdorf Goodman's store dominant colors in the evening dresses department are white, black, red, light pastels and sandy. Most dresses were made of fine silk, micro fiber or nylon. They were simple cut with little curve. I think colors were very simple and had it is great introduction for summer. Saks Fifth Avenue was presented by black, white, red and light colors. Their garment is mostly made of 100% silk, which gives the dress beauty and endurance. Bloomingdale's has to offer black, red, pink, and more spring and light colors. Also creamy and white are popular this summer season. Dresses were mostly made of silk, polyester or rayon. Bergdorf Goodman store offers fashionable merchandise for upscale customers. In the evening dresses department many customers were more browsing than buying. I also notice customer trying one of the evening dresses. There were few customers buying in the shoe and bags department. Saks Fifth Avenue carry rich and elegant merchandise for professional customers. few young clients trying. There were a couple of customers buying two dresses each. Bloomingdale's store offers evening dresses mostly for younger clientele. There were many customers trying prom dresses, and looking through the racks. Evening dresses department was very busy and I notice that many customers were buying merchandise. Bergdorf Goodman is known from its high quality merchandise. In the evening dresses department on 4th floor I notice that only one piece of the dress style of Vera Wang was available in size eight. The 6th floor on the other hand, had full size scale on display and also there were two dresses in size eight to ten. The average dress in the evening dress department was eight. Saks Fifth Avenue offers varied selection from youngest to oldest. In the evening dress department on 3rd floor I notice that there was a big selection of sizes from two to ten. Bloomingdale's store has great selection of fashionable merchandise. From my observations the evening dresses department had mostly smaller sizes from two to eight, also small and medium sizes separate dresses. In my opinion buyer for Bergdorf Goodman evening dresses department did fabulous job. I think that buyer has great taste with merchandise he/she bought. Red, black or white are the classic colors of this year. The buyer bought variety of sleeveless dresses and since the Bergdorf Goodman store is directed to the older ladies I believe the sizes the buyer pick reflect the customers needs. In my opinion buyer is doing good job for the store. He/ she knows Bergdorf Goodman's customer needs and expectations. I think that buyer of the Saks Fifth Avenue store does great job considering that she/ her must be creative and have sound judgment before buying merchandise. Buyer also needs to follow the fashion trends and keep with overseas fashion. In my opinion the buyer of the evening dresses department did wonderful job matching colors of the dresses with upcoming season. Light pastels, whites and short sleeves dresses will be definitely worn in this summer. I believe that the buyer for the Bloomingdale's store did fantastic job picking the colors and styles for the evening dresses department. There were many red, white and black colors, which are the 2002 summer trends. Also short sleeves, V-cut and sparkly dresses are in fashion for the upcoming spring. I believe that the buyer of this department did wonderful job for this department. Bergdorf Goodman, Saks Fifth Avenue and Bloomingdale's are the department store with fine fashionable selection of merchandise. Those department stores have many similarities and differences. One of the similarities is their location, which is in the middle part of the New York City. Since they all are department stores, they all offer classy evening dresses. They also carry similar designers and colors of evening dresses. The bigger difference between Bergdorf Goodman, Saks Fifth Avenue and Bloomingdale's is price range. Bergdorf Goodman offers evening dresses from $950 up to $8,000; Saks Fifth Avenue has its dresses from $600 to $6,000; and Bloomingdale's offers evening dresses from $250 to $900 a dress. From my observations the target customers for the Bergdorf Goodman store are more upscale, classy and conservative customers looking for fine merchandise and excellent service. I believe that evening dresses department of the Bergdorf Goodman store offers fine, quality and incomparable merchandise and that is what customer of Bergdorf Goodman is looking for. Bergdorf Goodman is the definitive New York shopping experience. City's most prestigious department store. In my opinion target customers for the Saks Fifth Avenue store are professionals, sophisticated customers who are looking for elegant and fashionable merchandise. I believe that evening dresses department of the Saks Fifth Avenue store reflects need of customer buying there. Elegant merchandise, elegant prices and customers aspire to the elegance of hallmarks of the Saks 5th Avenue. younger and trendy customers, who are looking for great deal merchandise. I think that evening dresses department of Bloomingdale's store offers what customer is looking for the best in selection and price. Bloomingdale's is the finest conceptual merchandiser in the country.